Greenpeace has been on the offensive against Apple this week, blasting the company for sourcing the power for its energy-intensive data centres from coal power plants. Today, Apple fired back with some remarkable facts, claiming it's a clean and renewable energy superstar. Apple says the data centres in Austin, Texas, Sacramento, California, Munich, Germany, and Cork in Ireland are already powered by 100 per cent renewable energy. The company has also been granted regulatory approval to use renewable energy at its data centre in Newark, California, which should be completed by February 2013. 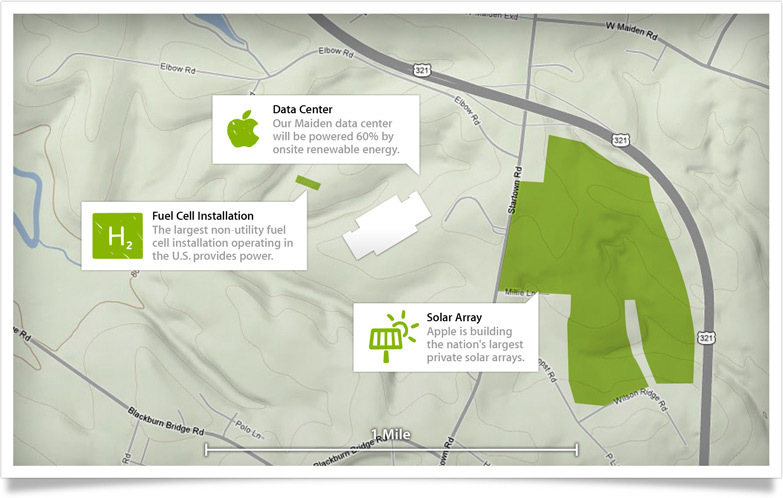 But what's more impressive are Apple's initiatives in Maiden, North Carolina, where the company is actually building two 100-acre solar farms that will fill 60 per cent of the data centre's needs. This should be completed by the end of the year. According to Apple, it will be "the most environmentally sound data centre ever built". Apple also says its forthcoming data centre in Prineville, Oregon, "will be every bit as environmentally responsible as our Maiden data centre".